African Drumming workshops (djembe, kenkeni, sangban and dununba) with Papis Sora Cissoko. Papis Sora Cissoko was born in Senegal and has been living in England since December 2013. He is a Griot, and therefore has intimate knowledge of traditional drumming and its place in West African Culture. Griot families have passed their knowledge of traditions, drumming, song, stories and dance through the generations over many centuries. Join us for a wonderful day of drumming with the very talented Mohamed Gueye. Just joined site and so finding my way around. 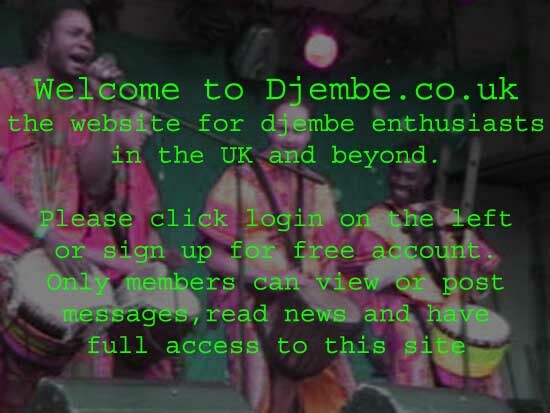 Anyone in and around Liverpool wanting to learn how to play Djembe,give me a shout and i`ll tell you what it`s all about. Join us for an afternoon of African drumming and dancing in Brighton with Sorel Conde and Gibril Tunkara! Nansady will be coming to London for a 2 day African Drumming workshop at the Institute of Contemporary Music Performance in North West London. Cost: �40 per day or �70 for both days. A �10 discount will be offered to students of the Institute. Drum hire can be arranged, but if you have your own djembe and/or Dundun please bring it with you. To keep up to date with all information and meet your fellow drummers.